I got to wear my jacket! My son Michael and his wife Carolyn hosted a family get-together on Sunday. Son Steve and his two daughters were there from Colorado. I had both my digital camera and my Flip video camcorder with me, but instead of taking pictures, I decided to use the opportunity to talk individually with family members I rarely see. So I don’t have any pictures to show you. But, my jacket was a sensation! The reaction was all that I could have hoped for. DIL Karin said the magic words, “You MADE that?” The jacket embellishment got lots of careful scrutiny and rave comments. Ah, very satisfying. Karin, who is Noah’s mother, is interested in my Flip video camcorder, so I gave her a chance to try it out, and you can see me modeling my jacket. First, you’ll see her husband Pete, then my nephew Jon and his friend Corinna. Granddaughter Rachel (20) also tried the Flip camcorder, but for some reason, Flickr will not post it here. But you can view it at Flickr. First you will see adopted son Bill stirring the pasta sauce, then my first husband Skip, Carolyn and Michael (the hosts), my niece Kim, my son Steve, and a glimpse of Bill’s wife Chris. 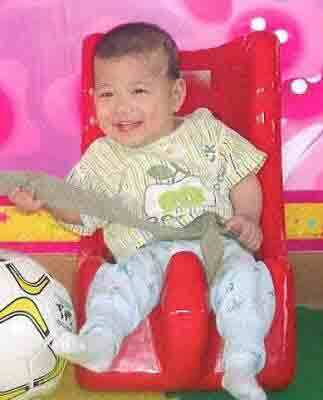 There were 26 of us, including baby Luca, seated at three tables. For me, the best part of the event was having one-on-one conversations with several of my nearest and dearest, whom I rarely see or hear from. Michael and Carolyn are terrific hosts. Their family get-togethers are so much fun, with wonderful food. Michael, Bill, and Pete were shucking raw oysters on the patio. Oh, what a treat for me! Well, all our family get-togethers are fun. I am very fortunate in having a loving family, all of whom get along with each other and enjoy each other. Oh, the funny stories and memories. Lots of laughter and easy conversation. I hope (if you are in the U.S.) that you have as happy a Thanksgiving as I had on Sunday. Here’s the little girl for whom the 100 wishes quilt is being made. She’ll be in the U.S. in a few weeks. 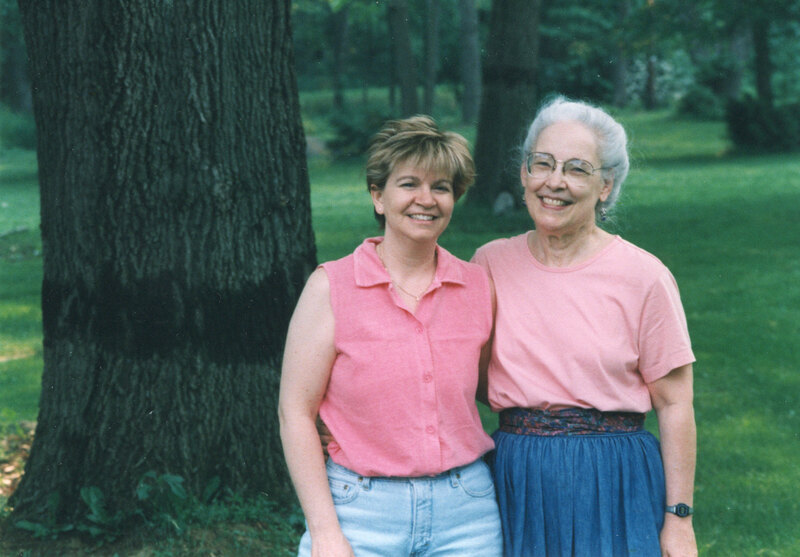 Andrea and I met almost ten years ago when we were both patients at the Clymer Clinic in Quakertown, Pennsylvania, a healing center for people with ME-CFS. We spent two or three weeks together living in the Sanctuary. Here we are outside the Sanctuary. Now Andrea is one of the rare people with ME-CFS who recover. She and her husband are adopting a child from China, whom they will bring to the U.S. early next year. In the part of China from which their daughter comes, there is a custom of creating a 100 wishes quilt for a new baby. 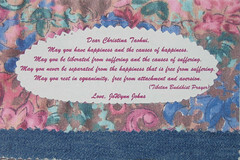 Family, friends, and well-wishers contribute squares of fabric with a card expressing a wish for the child. These squares of fabric are made into a quilt and the cards go into a scrapbook. Andrea and Brian decided to adopt this custom along with their child. When I received the announcement of the coming adoption and the request for a square of fabric for the 100 wishes quilt, it didn’t take me long to decide what to do. Years ago I had cut up the denim skirt I was wearing in the photograph and used some of it to make a quilt for my youngest grandchild, Noah. Then I thought of the floral designs Allie makes with flowers from her garden. She graciously gave me permission to use this one. For goodness’ sake, go take a look at this beautiful design on her blog. And see what she’s up to now. 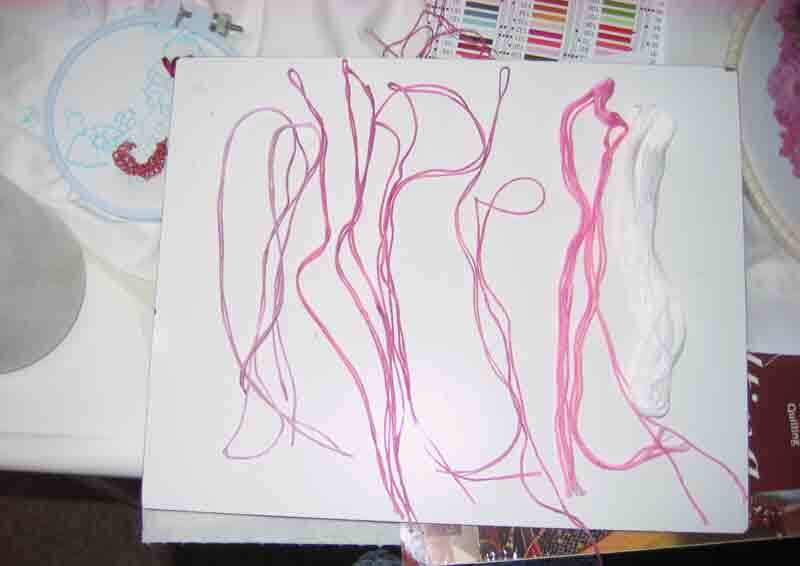 I started with the pink and white DMC threads on the right and produced the shades on the left. Some were just right. Here’s the work in progress. 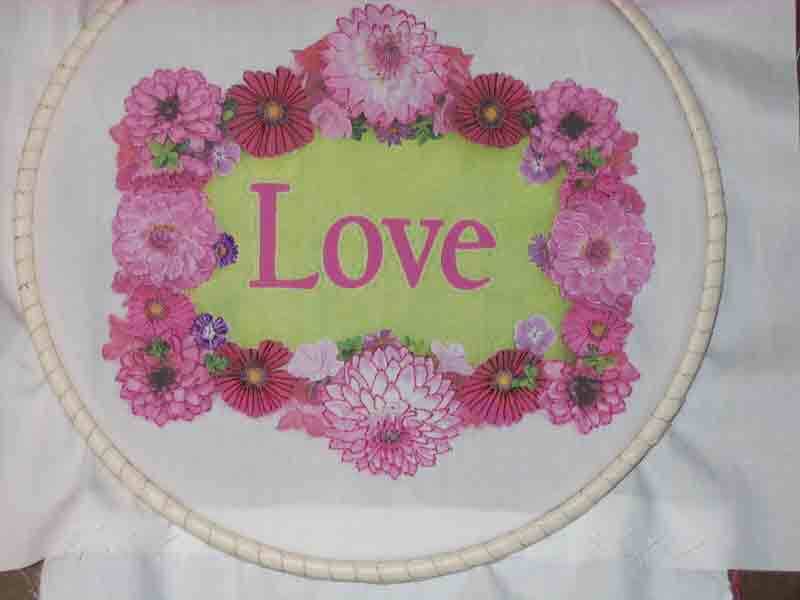 I used a single strand of DMC cotton floss for all the stitching, couching it around the petals. Not all done here: Once I had finished the stitching, using fishbone and detached chain (lazy daisy) stitches for the leaves and French knots for the flower centers, I ironed Misty Fuse to the cotton fabric. Then I cut it out, like making a stumpwork slip, I suppose, except that I was cutting right up against my threads with a pair of old embroidery scissors. Very slowly! 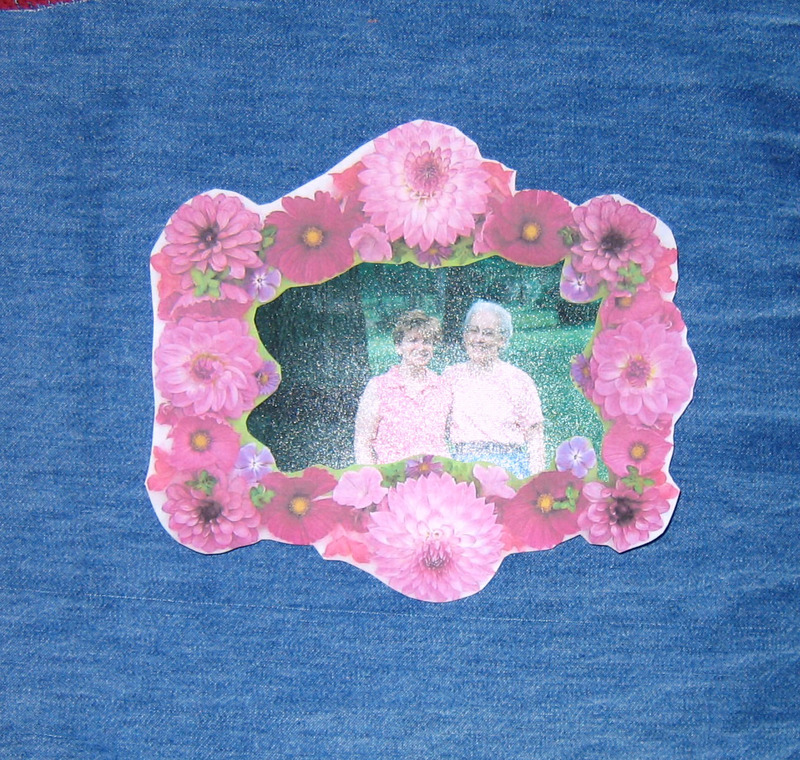 I printed the photograph on fusible cotton and ironed it first, then ironed the floral frame over it to my denim. Here’s the 8″ square, all done. By clicking on the image you will go to Flickr where you can see which threads I dyed and get a close-up of the whole piece. Next I made a card to accompany the square. For that I photographed the belt I was wearing in the original photograph, resized it, and printed the image on fusible cotton. 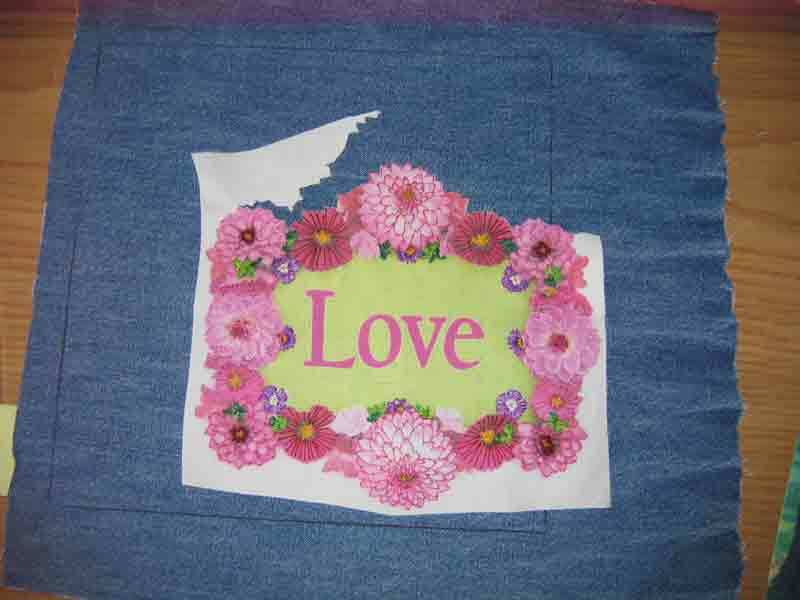 The wish was also printed on fusible cotton and ironed to the print fabric. 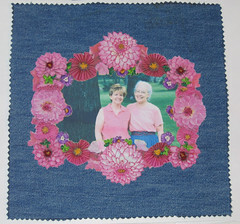 At the bottom is the piece of denim fabric to associate the card with the square. I tried adding some stitching, but getting the needle through the fusible cotton was just too hard. The backing is a 4 X 6 inch piece of Timtex. Twenty-five hours in all, with lots of false starts and a lot of time spent at the computer, getting the colors to print satisfactorily on fabric. Ernie mailed it yesterday afternoon. Sharon has moved her blog to a new service. It has a whole new look. You can find it now at Pin Tangle. Do stop by and add her new URL to your RSS feed. I finished the jacket on Monday, after a marathon of stitching over the weekend. Notice, if you can, in the side view, the embroidery on the bottom of the pants leg. I didn’t do it. 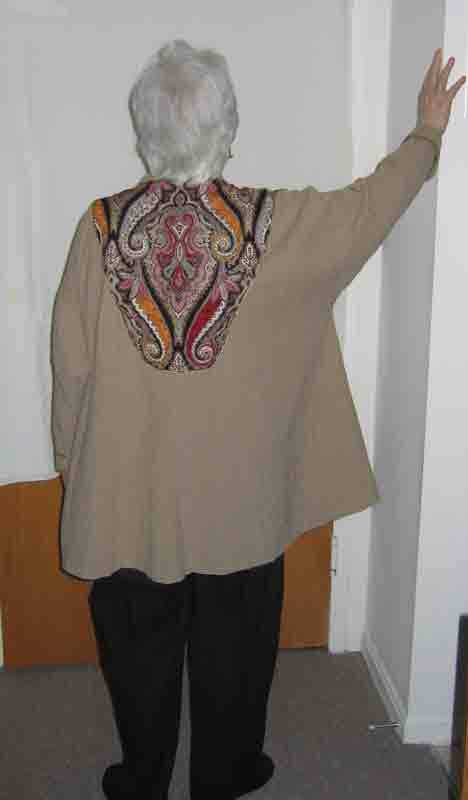 It was hand-stitched in India and bought from Marketplace India, and it perfectly complements the jacket embellishment. I’ve had the pants for several years, just a lucky match. Note, too, the cuffs on the sleeves. More about them later. Now for some last details. Here’s a close-up of the back. Each whipped spider wheel used to fill the paisleys has a bead in the center. 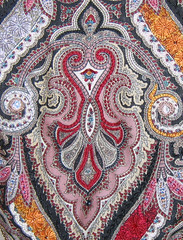 And each paisley is stitched in five shades of the color. The bottom looks uneven because the jacket is hanging in slight folds from a hanger. 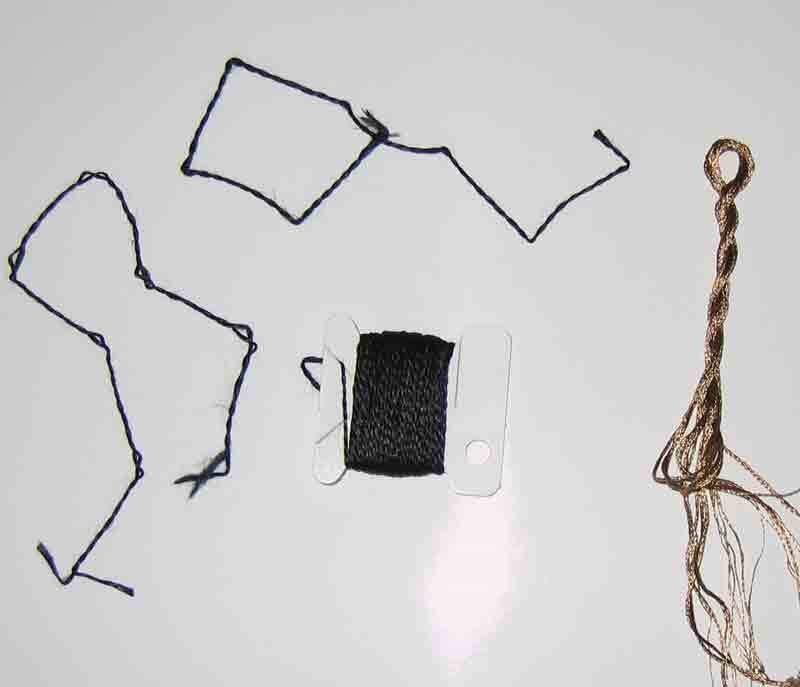 The black thread is an antique (1900) rope silk. As you can see, each strand is two strands twisted together. 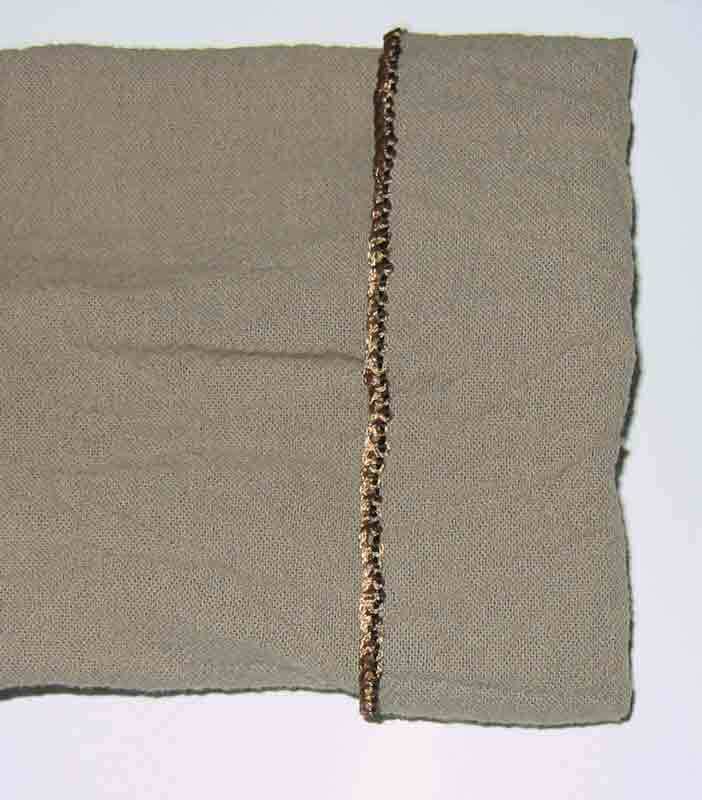 It doesn’t look like much here, but when it’s stitched, the fuzziness of the thread disappears into a lustrous sheen. A lot of it came in a microwave oven-sized box of off-loaded stash from an EGA chapter in California. Some members had read my article in Needle Arts June 2000 and learning that I am housebound, they must have thought I couldn’t get threads. In any case, after many hours of sorting and untangling, I had a huge addition to my own stash. It included quite a lot of the antique silk, in several colors and kinds, and some of them had their original labels. That’s how I know its date. The dark gold thread is another story. 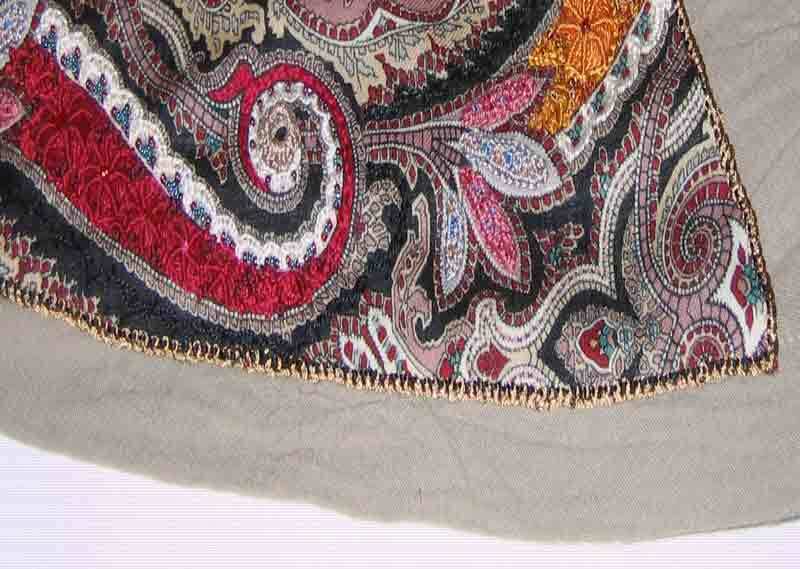 Intending to order one skein of this color of Rajmahal Art Silk, I inadvertently ordered three skeins. I used a little in French knots on the gold paisleys. 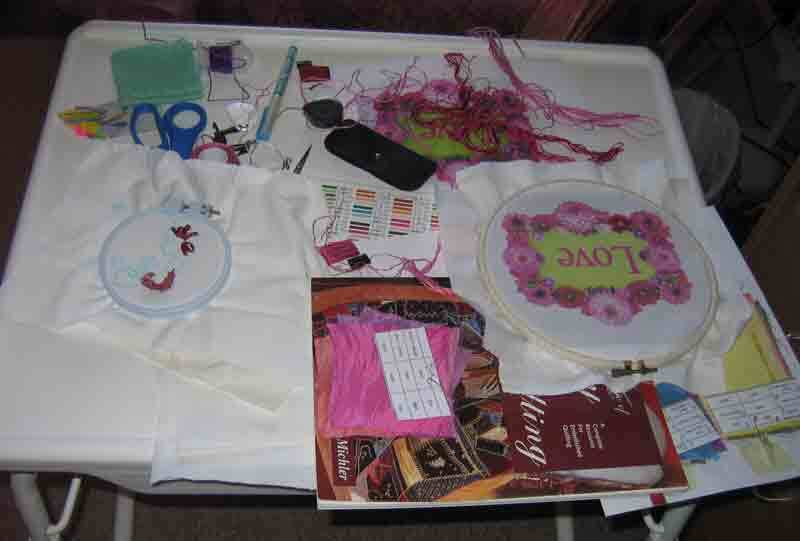 When it came time to choose threads for the border, it looked just right. Well, I’ve used very nearly two skeins, so more good luck. I used six strands in the needle for threading the back stitch with this thread. Here you can see the border. As well, you can get a good look at the pink (labeled “mauve”!) and gray petal shapes, in detached buttonhole with straight return over padding. I used alternating barred chain stitch in black #5 pearl cotton to highlight the black lines around the central motif. Here, too, you can see the buttonhole stitching of the scallops that outline the paisleys. That idea came from Mary Corbet. (She also suggested some use of whipped spider wheels.) There are groups of beads in the center of each scallop. 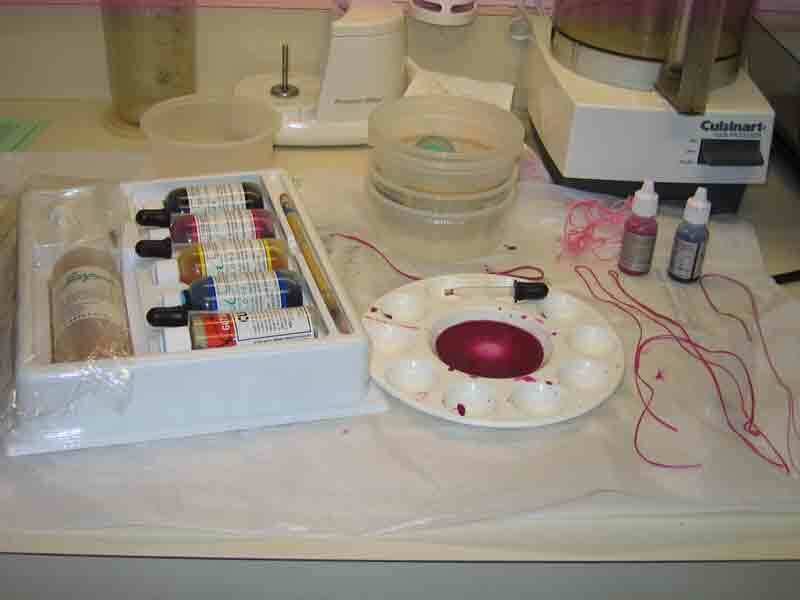 The idea to use beads came from Sharon Boggon. Thanks to both of them, who left comments with their suggestions when I posted that I was stuck about how to embellish the scarf. 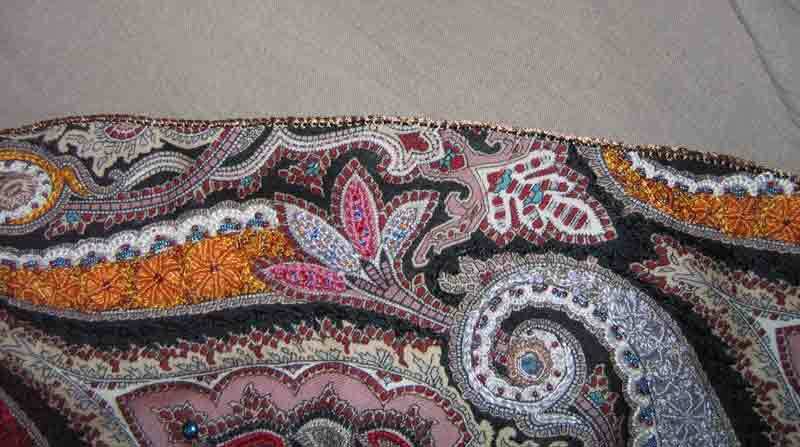 Here’s a close-up of that central motif, picked up with beads and stitching in #5 pearl cotton. After several false starts, I used chain stitch and straight stitch for the broken lines, outline stitch for the finer red and gray lines, and heavy chain stitch for the larger red bottom shape. 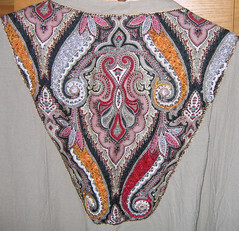 The black line at the top is chain-stitched in #8 pearl cotton. Needing to shorten the sleeves, I made cuffs and repeated the border on them. After spending 128 hours on the project, starting in September, I’m pleased with the result. Now all I need is an occasion to wear it!